Stephen Joseph has recently stepped down as Chief Executive of Campaign for Better Transport, having been in that role since 1988. His wide-ranging expertise and contacts have helped to make the organisation the country’s leading transport NGO (non-governmental organisation). Among his highlights are: •	Persuading the Treasury to cut the road-building programme in the 1990s •	Campaigning for increased rail investment and new/reopened lines and stations •	Highlighting the importance of buses and the impact of cuts in bus services. Joseph was a member of the Commission for Integrated Transport from 1999-2005 and a member of the Standing Advisory Committee on Trunk Road Assessment (SACTRA) during its inquiry on transport and the economy. 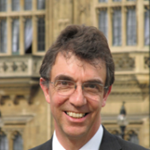 He was also on the steering group for the Government’s road user charging feasibility study 2003-4, and was a member of challenge panels or advisory groups for Government plans on high-speed rail, eco-towns, transport appraisal and the Local Sustainable Transport Fund. Joseph was awarded the OBE in 1996 for services to transport and the environment.